The absorbed power is thus proportional to the square of the optical input power. 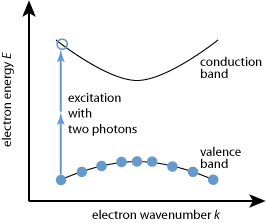 Two-photon absorption is the simplest variant of multiphoton absorption. Figure 1: Two-photon absorption in a semiconductor allows for absorption of light even if the photon energy is below the bandgap energy. In an insulator or semiconductor, two-photon absorption can normally occur only if the photon energy is at least half the bandgap energy. Therefore, there are e.g. no losses via two-photon absorption when ultrashort pulses at 800 nm wavelength propagate in a silica fiber. On the other hand, two-photon absorption at the same wavelength can occur in semiconductors such as GaAs, having a much smaller bandgap. This is used e.g. in compact autocorrelators for pulse duration measurements: a photodiode which is normally not sensitive at the laser wavelength exhibits a photocurrent only due to TPA. The phenomenon of two-photon absorption finds applications in various technical areas. For example, it is used in simple autocorrelators for pulse characterization, where TPA in a photodiode, having a bandgap energy larger than the photon energy, is exploited to obtain a nonlinear response. Also, two-photon absorption is often used in fluorescence microscopy (two-photon microscopy) for exciting fluorescence with an infrared laser beam, which can easily penetrate the sample. In other cases, TPA is exploited for optical power limiting or for microfabrication. Under certain circumstances (illumination with ultrashort pulses), it is even possible that the human eye responds to infrared light due to two-photon absorption processes in the retina . Detrimental TPA effects can occur for nonlinear frequency conversion of ultrashort pulses in nonlinear crystal materials, particularly for conversion of short wavelengths, e.g. in UV sources. The transmission of pulsed pump light (or e.g. frequency-doubled light) is then significantly lower than for continuous-wave radiation with the same average power. In some optical materials, the generation of free carriers via TPA can cause photodarkening. TPA can also modify the saturation characteristics of saturable absorbers such as SESAMs, leading to a roll-over of the saturation curve which can help e.g. to suppress Q-switching instabilities.